Almost 1 out of every 3 people will develop shingles in their lifetime according to the Centers for Disease Control and Prevention. Physical symptoms from shingles are inconvenient at best and persistently painful at worst. Capsaicin, the active ingredient in chili peppers, is often recommended by doctors as one line of treatment to relieve the pain from shingles. 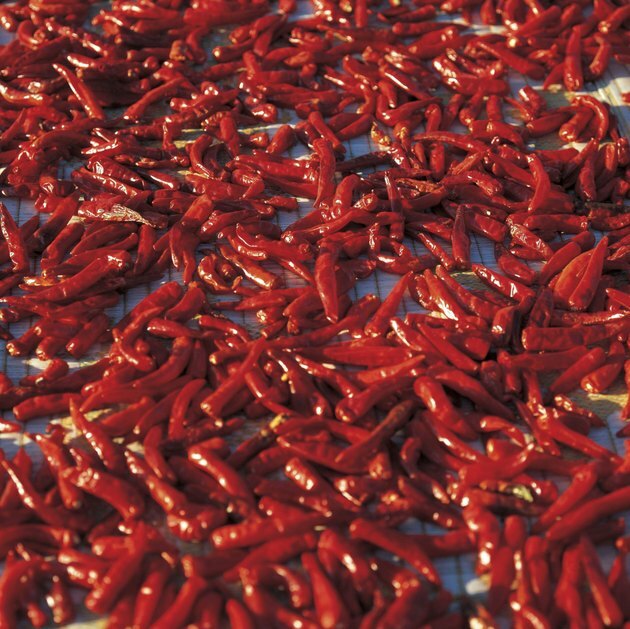 Before using capsaicin for shingles, discuss it with your doctor. The herpes varicella-zoster virus causes chickenpox during childhood and can re-emerge as shingles later in life. After chickenpox has subsided, the virus remains dormant in the body. Older adults, particularly those over 60, are more at risk for developing shingles. Symptoms include itchiness, pain and tingling on one side of the body. A rash with blisters develops soon after, but all symptoms typically disappear in a few weeks. Sometimes, however, postherpetic neuralgia -- pain that continues after the rash has subsided -- continues for months after. Capsaicin is the substance that give chili peppers their signature spiciness, but it can also affect the body's pain messages. Chemicals called substance P carry pain messages to the brain, but are temporarily reduced with capsaicin. Typically, doctors will recommend capsaicin in the form of topical creams for pain relief in postherpetic neuralgia. Research about shingles and capsaicin is inconsistent and success may depend on the individual. Using capsaicin cream for pain can cause discomfort in the form of a burning sensation at application. This is a typical effect of capsaicin cream, but sufferers of shingles often feel the burning sensation intensely. Initial pain usually dissipates after applying the cream for several days. Capsaicin may interact with some medications, including ACE inhibitors, aspirin, some asthma medications, stomach acid reducers and blood thinners. If your doctor approves using capsaicin cream for postherpetic neuralgia from shingles, a typical dosage is to apply the cream to the affected areas four times a day. Consistent use is important in capsaicin's pain-relieving effects and will help reduce the initial intensity of burning sensations. It can take from three to seven days to see the pain-relieving effects from capsaicin.